Choice a method: text format or HTML format: Reserved for forums having the package, the HTML allows you to format your message as you wish: bold, italic, colors, images,... It is an enriched format composed of code, which you can write simply thanks to the integrated editor. On the contrary, the simple text format is plain text without any formatting. An email address or site URL will be automatically transformed into a link by the email client receiving the email in this text format. The HTML format is generally preferred to allow advanced customization of email content, and make the recipient want to read it. 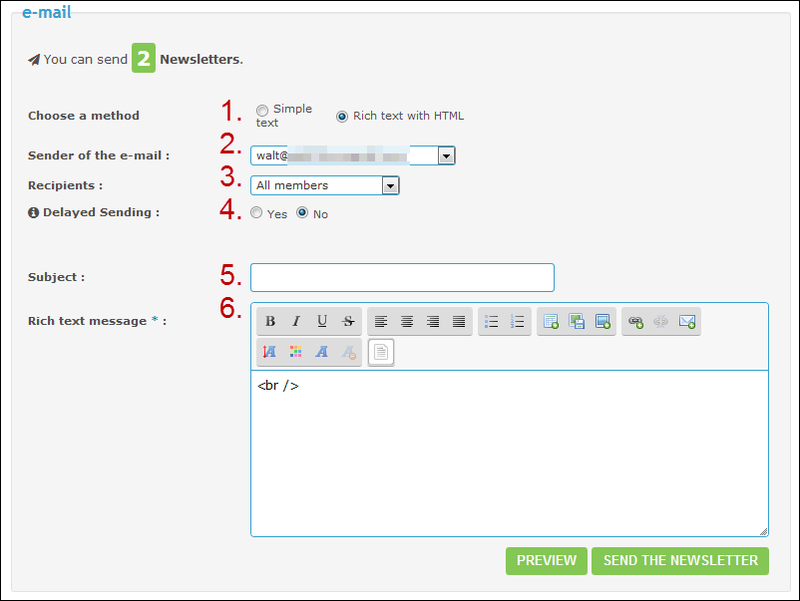 Nevertheless, some webmails do not allow to receive HTML emails (it is however more and more rare). Also, most webmails block remote content to protect its users, so be sure to keep a clear and effective newsletter, even if the images are not displayed. Attention, this field has to be selected before writing the newsletter: you shouldn't switch mode after having started the writing or you will loose the text! Subject : it will be the title of the email that users will receive. You should choose the good one, it will generally determine the choice that users will make between opening it, or delete it directly. Message : this is the content of your email. For this content to be valid, your newsletter must contain a text (an image alone is not enough). Forums in free packages can't send more than 2 newsletters per 30-day rolling period. This limit is increased to 4 newsletters per 30-day period for forums that have chosen the package and to 8 for forums that have subscribed to the package. Once your email is ready to be sent, click on "Send the newsletter". If you have chosen HTML format, an intermediate step will then slip into the process, asking you to insert an equivalent of your newsletter in text format, in order to allow users who cannot display HTML in their mailbox to still have content. Then, the newsletter will be sent a first time to the email address of the administrator who writes it in order to give him the possibility to return to the edition of this one if it does not appear correctly, or to validate the sending. Finally, if the sending is validated, the email is sent to all users concerned according to the recipient's choice. Note that receiving the newsletter may take more or less time depending on the number of newsletters to send (see next point in this tutorial). In order to avoid a blacklisting of forums by email providers when sending hundreds of thousands of emails, Forumotion creates waiting lists per server and processes them per packet according to their order of arrival. Therefore, the sending and receiving of the newsletter may not be simultaneous. The sending depends on the waiting list on the server to which the forum belongs. The more newsletters the forums send, the longer the waiting list will be, as will be the time required to send/receive the newsletters. Thus, when the newsletter is sent, it is placed on a waiting list before being sent and does not appear in the archive folder until it is sent. We understand the inconvenience that such a possible delay in the dispatch/receipt of these newsletters could cause. Nevertheless, it is the only way we have to protect the forums against total blacklisting by mail clients. As indicated in the first part of this tutorial, it is possible for you to choose a delayed sending date for your newsletter. It will therefore not be sent before the recorded date. Note that you will not be able to schedule more than three newsletters to be sent on the same day. You can schedule more than 3 newsletters only if you specify sending dates over several days (more explanations). You will find all of your scheduled newsletters in the "Delayed sending" box. You can change them at any time before the sending date by clicking  and preview them by clicking . It is also possible to delete them, which will cancel their sending. When a scheduled newsletter is definitively sent on the chosen date, you will find it in your archives. To avoid confusing it with immediate mailings, this one will have a small clock  as icon. Note that only sent newsletters appear on this page. As explained in point 2.2 of this tutorial, a waiting list exists for sending newsletters: as long as your mail is in this list, it does not appear on the archive page. This tutorial was written by Walt (French support forum).